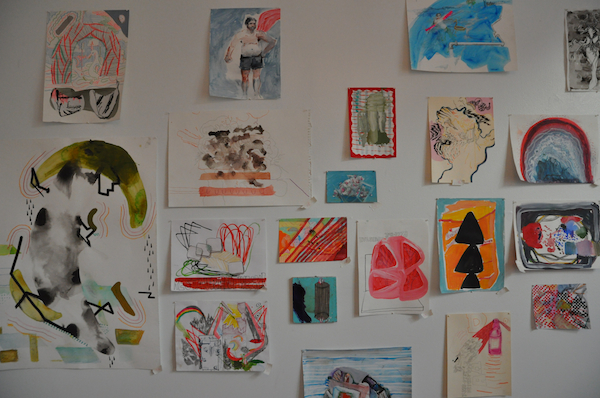 Artist Julie Torres hosted two months of collaborative drawing nights at Hyperallergic HQ in February and March of this year. 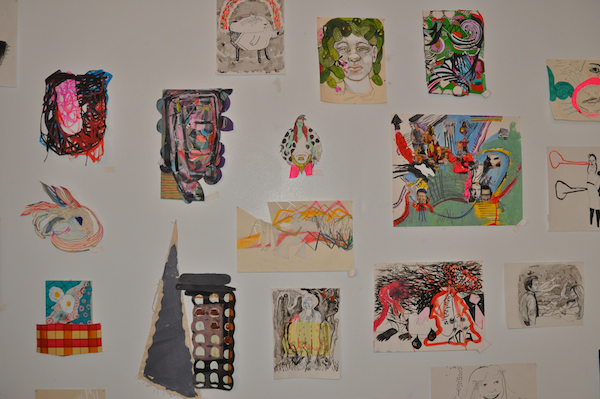 The project generated 100 drawings and the resulting show, titled So Happy Together: Forty-five Artists and Their One Hundred Collaborative Drawings, opened last night at Norte Maar in Bushwick, Brooklyn. 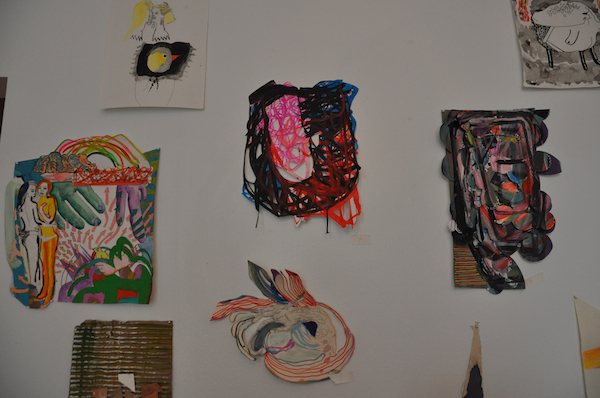 The event, which took place on the first night of the 2011 Bushwick Open Studios, attracted over a hundred visitors. All the work sold during the show will benefit Norte Maar, an important nonprofit that is a vital part of the local art scene. Silent auction bids starts at $50 but work can also be purchased outright for $150 each. 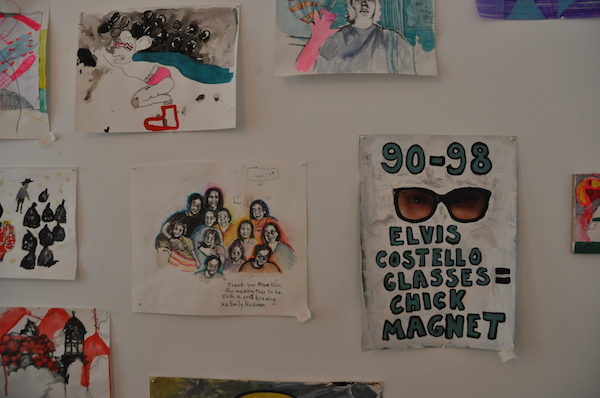 A few days ago, before the show opened, Torres gave me and artist Austin Thomas a private tour of the show and we asked her to explain how the collaborative process worked. Here is a short video tour of the show. As an added bonus, Torres has also offered 10% of all the proceeds from the art sales to Hyperallergic as a thank you for the use of our office for the project. 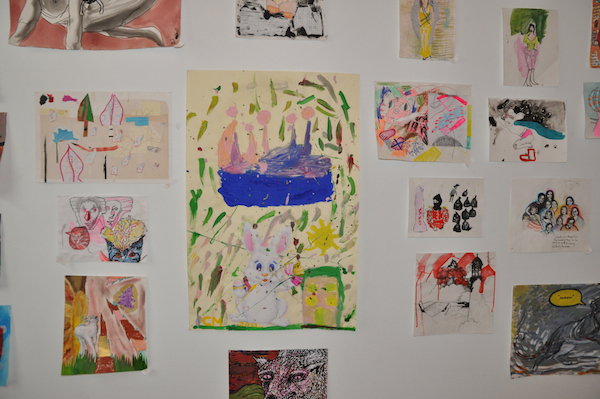 The participating artists are Liz Ainslie, Joe Ballweg, Athena Wyman Battalen, Andrea Bergart, Judith Braun, Peter Brock, Steven Brower, Maanik Singh Chauhan, Kyle Chayka, Cojo, Lauren Collings, Joy Curtis, Paul D’Agostino, Ben Godward, Emily Hochman, Andrew Hunt, Steven Ketchum, Wendy Klemperer, Osamu Kobayashi, Andrea LaBouff, Matthew Landon, Brian LaRossa, Brian Leo, Geddes Levenson, Gili Levy, Amy Lincoln, Rebecca Litt, J.P. Marin, Karen Marston, Shanna Maurizi, Paul McEnery, Chris McGee, Brooke Moyse, Mike Olin, Sheryl Oppenheim, Leif Parsons, Alex Porcaro, Allie Rex, Molly Roberson, Ebony Rose, Abe Storer, Austin Thomas, Julie Torres, Eric Trosko, Yejin Yoo and Lily Zhang. 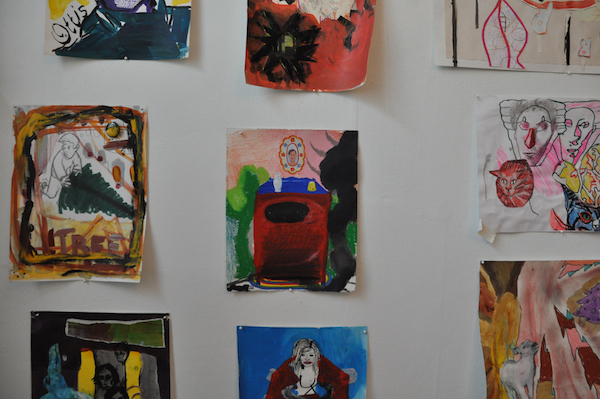 Here are some images from the work on display. 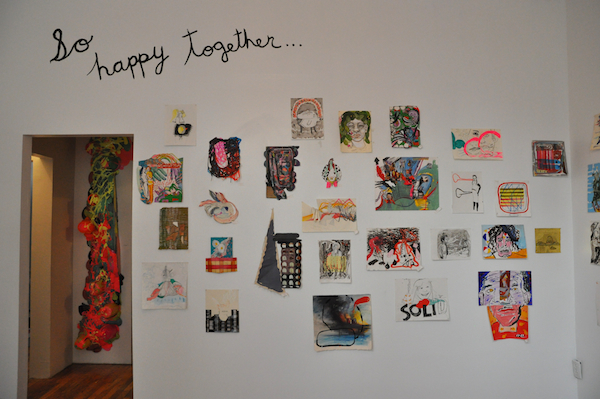 So Happy Together continues at Norte Maar (83 Wyckoff Ave., #1B, Bushwick, Brooklyn) until June 28, 2011.